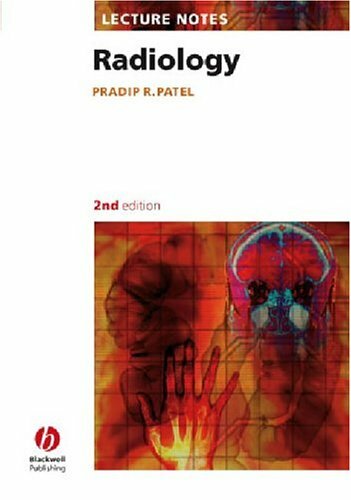 Amazon.com description: Product Description: "Lecture Notes: Radiology" is a concise course in radiographical interpretation presenting the essential core knowledge for medical students and house officers. It provides a fundamental understanding of radiology, focusing on the conditions with which the junior doctor should be familiar. The first edition was awarded a prestigious BMA book award in 1998. The book emphasises the pattern of disease as seen on commonly used X-rays and contrast examinations, with explanatory notes on further investigations by imaging techniques such as ultrasound, CT and MRI. The book contains: clear illustrations; clinically orientated text arranged into organ systems; and, a chapter on examination hints and viva technique. Key fact boxes are included to support the understanding of key information and this text will prove invaluable as a rapid revision guide for finals. "Lecture Notes: Radiology" is written specifically for students, junior doctors, specialist nurses and staff in the radiology department. Review quotes for the previous edition: 'This is a fantastic book which presents the essential core knowledge for medical students' - Sphincter, "Liverpool Medical School Gazette". About: "Lecture Notes: Radiology" is a concise course in radiographical interpretation presenting the essential core knowledge for medical students and house officers.